Circle Line Sightseeing Cruises, New York City’s iconic sightseeing company (more than 60 million passengers since 1945), recently unveiled a new joint program with New-York Historical Society, NYC’s iconic cultural institution, which incorporates the latest historical findings and scholarship to update all of Circle Line’s popular narration programs. 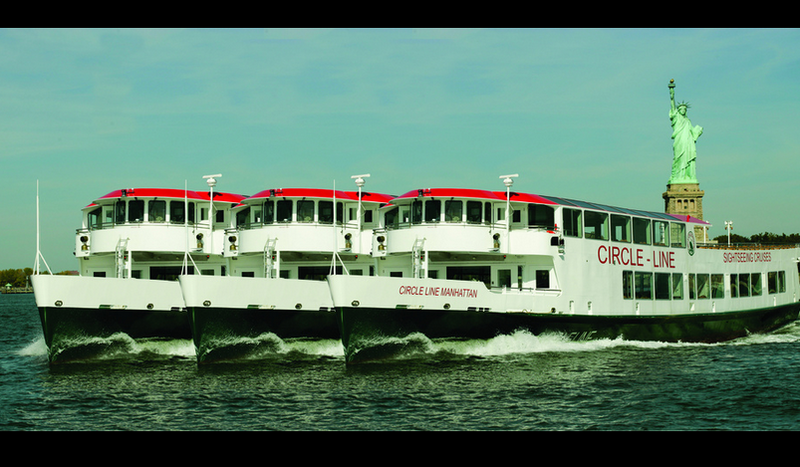 The themed cruise New York City: The First 1 Million Years will operate on Circle Line’s regular cruise schedule starting this summer and, since it covers the highlights of the standard Circle Line excursion, we highly recommend it for families interested in history. You can really appreciate the sheer majesty of NYC, like Elysium, from the outside in. Tourists experience the City from a floating perspective sans traffic, and native New Yorkers can gain a greater understanding of the City and its historic port in a compelling and comfy way. We rate this a win-win for the whole family! The cruise left from Pier 83 on 42nd street, turned east at the mouth of the Hudson River close to the Statue of Liberty, then cruised up the East River to the Brooklyn Bridge, where it turned around and came home to Pier 83 again. The May 15 kick-off is being followed by the final two phases of the programs, including the compilation of pop-culture anecdotes and topical snippets from the past one million minutes in the life of America’s greatest metropolis. The third and final phase will focus on weaving all the threads together to create a narrative tapestry offering an entertaining and comprehensive perspective on Gotham and its early history. Each cruise will feature a live narration by Circle Line tour guide trained under the New-York Historical Society partnership, which will enable Circle Line to modernize all of its tour programs. Food and beverages — not their strong suit — are catered by Legends Hospitality. By the way, if you’re sailing with very young children, consider the special Kids Cruises with live entertainment on board. They’re only 75 minutes long and may be better suited to your (possibly) restless young sailors; cost is $29 per adult; $20 ages 3-12 and free for those under 3. Reserve these themed cruises in advance; booking info is available at the Circle Line site; the tours schedule can be found here.